Gilbarco Veeder-Root is committed to maintaining service and support for all their solutions for the full extent of their hardware lifecycles. This support continues until they can no longer provide spare parts, or when significant technological advances dictate otherwise. The Passport PX52 (PX51) hardware set was released in 2005 and has served thousands of Gilbarco Veeder-Root customers with fourteen major Passport releases and millions of hours of store operation. The PX60 Passport All-In-One hardware was introduced as the next evolution in April 2014 and sold across all petroleum/convenience networks and markets over the past three years. Support for the PX52 (PX51) hardware set will be discontinued starting with Version 11.02 (Release 4) and all subsequent releases. This release is currently scheduled for production release starting March 2018. 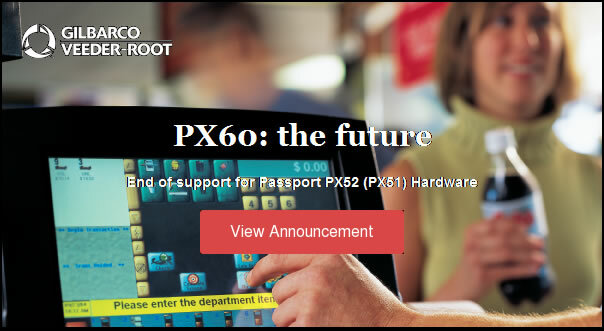 To further help with key dates that pertain to the PX52 (PX51) hardware End-Of-Life support, please view the End-Of-Life Announcement: Passport PX52 (PX51) Hardware Gilbarco Veeder-Root has published. The announcement includes a chart of milestones along with links to embed the key dates into your calendar as reminders. PX60-Tradeup discounts are still available if you wish to upgrade from your existing PX52. Call us at 1.800.451.4021 to upgrade your system today!